The ImmersionRC Vortex 285 First Person View FPV racing system team have combined a unique foldable mini-quad frame and added the best of ImmersionRC products to deliver one of the best racing systems to date. This Vortext is supplied with the high-end 1806, 2300kV T-Motors for best performance while racing. The ImmersionRC Vortex 285 has an integrated flight controller, with a 3 axis Gyro, 3 axis Accelerometer, and barometer pre-programmed with CleanFlight; this means that the Vortex flight controller is future-proof through downloadable updates. The PIDs (tuning of the systems performance) are adjusted on-screen, this is a very easy to use menu, and being driven directly from the R/C Tx there is no need for a laptop at the field, no more dip-switches to flip or adjust. The Vortex 285 has a direct high-speed interface to a full-graphic OSD system, with USB port on the back of the Vortex 285 quad for programming and updates. The pre-installed NexWaveRF 5.8GHz video transmitter, with 40 channel support, ensures compatibility with any 5.8 GHz A/V Rx on the market. ImmersionRC’s exclusive RaceBand allows for up to 8 pilots to fly together. This makes the Vortex a very flexible system which should work with any other systems you already have. Please check that you are allowed to use this transmitter in your country. The flexible Vortex 285 camera mount supports both a flight cam, and an HD camera such as a GoPro, or Mobius. The flight camera is protected from impacts, and is mounted on a vibration-dampened carbon-fiber plate. The Vortex 285 has an adjustable bracket allows the camera to be tilted to ensure a good forward view during high-speed racing. The powerful 3A switching regulator built in to the Vortex allows you to add any HD cam (GoPro included), this will take its power direct from the flight pack, allowing unnecessary camera batteries to be left at home and reducing the overall weight of the system. The Vortex 285 includes an industry-first; you can tune the flight parameters from Pro-Racers right in the box. 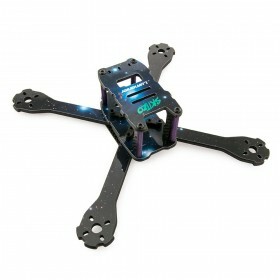 Just select the racer, prop size, HD camera choice, and the Vortex 285 OSD will setup the flight controller for you. The Vortex 285 has been in testing and some of the biggest names in FPV Quad Racing have tweaked it for peak performance. A set of 8 24-bit RGB LEDs sit on the tail of the Vortex 285, sandwiched safely between the upper, and lower frame plates. These LEDs are controlled by a dedicated 32-bit ARM processor, this means that you program the LEDs to show something as mundane as the pilot’s favourite color, or just about anything else which is released in future updates of the user-upgradable firmware. Just add a compatible R/C Rx (EzUHF preferred of course), a battery, and go fly, everything else is included, from the SpiroNET Tx antenna to the props. I got this package very quick and all I need to get it a compatible transmitter. I asked for a battery and case and all came at the same time. Great communication between customer services and myself. I would highly recommend this website. Took delivery of my new vortex racing quad and was impressed with it as soon as i opened the box. I put an EzUHF 4 channel Lite on it... upgraded the firmware and bound it to my Taranis. I was flying within 30 seconds of doing that. All the setup is done through the OSD on this thing (through your goggles or screen). This thing is on absolute rails right out the box with no need to tweak or mod anything at all. Highly recommend it to anyone that wants to fly one of these racers like a pro. I did one flight line of sight and then i was flying in full acro mode from the word go. Flips and rolls were being done in fast forward flight on the first FPV flight. I cannot recommend this thing enough... so much so that i have just purchased a second one so that i'm never out the game. These things look awsome, crash really well and are really fast right out the box. Being a newbie, I had teething issues setting everything up. I have a X9D+, Martin helped me set everything up, hassle free. He really showed great customer service and as a result I bought more products from BYOD. I'm also happy to buy more! Thank you for all you help in getting my airborne with my Vortex. Both Martin, Mike and the other assistant (didn't get his name), also provided invaluable assistance and information throughout. Thank you. Was not straight out of the box for me, due to spektrum dx8 and a compatible receiver, but with help of Martin :) he helped big time to get me airborne very quickly (very grateful indeed) thanks martin the vortex has ticked all my boxes and more, for my first racer, a very happy customer. Awesome, right out of the box. This thing flies like a dream, exceeded my high expectations. The fully integrated OSD, setup wizard and pro-tuned PID's means you really can "fly like you stole it" in a matter of minutes from unboxing. It shrugs off crashes with a simple re-snap of the arms and with the increasingly infamous "indestructible" props you can just keep on flying until you run out of batteries.